Updated: 5:32 p.m. | Posted: 11 a.m. Anyone who's ever come upon the Devil's Kettle waterfall along Minnesota's North Shore and seen the falls plunge into solid rock then disappear has wondered where the water goes. Hydrologists now think they've solved the mystery, and while the answer may not be worthy of a Scooby-Doo moment, it's still intriguing. 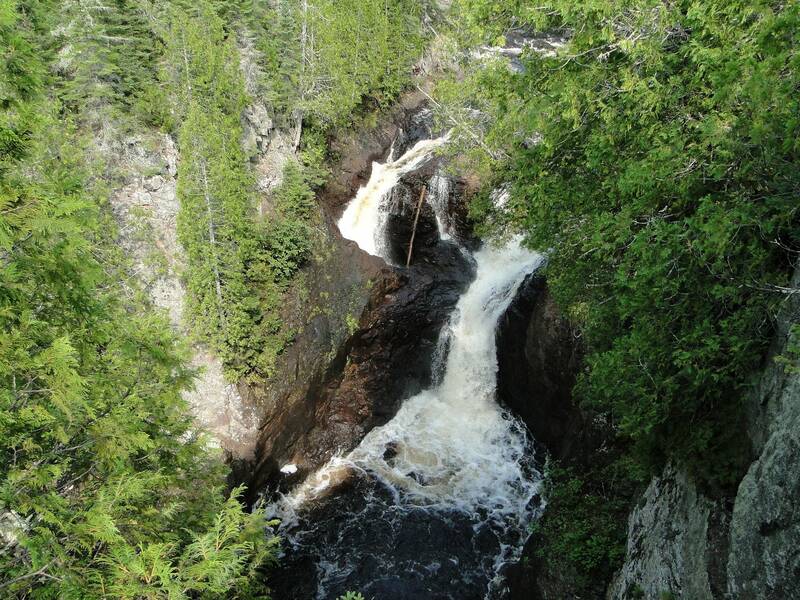 The falls sit above Lake Superior about a mile inland on the Brule River at Judge C.R. Magney State Park near Grand Marais, Minn. The river splits in two at an outcropping of rhyolite, volcanic rock as hard as granite, according to the Minnesota Department of Natural Resources. The east side of the river falls 50 feet into a pool in typical waterfall fashion. The water on the west side falls into a hole in the rock and vanishes. If you tossed a stick there and watched it go into the hole hoping to see it bob out of the water somewhere when the river flattens out, you'd be disappointed. • MPR News asks: What do you find mysterious about Minnesota? That mystery has long fueled speculation about where the water goes, said park manager Peter Mott. "I've heard locals describe the possibility that this water splits at the waterfall and some of it flows into Canada," he said. "I've actually heard people suggest that it may flow somehow back into the Mississippi River." But the most common theory is that the water flows underground and then emerges somewhere under Lake Superior. There long have been stories about visitors throwing everything from GPS trackers to colored dyes to ping pong balls into the kettle. "And then waited for it to come out at the bottom," Mott said, "and then never found it." So what happens? Does the water lead to a giant hidden, underground civilization? Sadly, no. The DNR said Tuesday it used science to conclude the water that disappears into the rock at Devil's Kettle reenters the river from underground. According to the DNR, hydrologists last fall found nearly identical volumes of water flowing both above the Devil's Kettle waterfall and below it. That shows the water is likely resurging in the stream below the waterfall. "What we think is happening is the water is going in the kettle, and coming up pretty close to immediately downstream of the falls," Green said. Just to be absolutely sure, however, Green and Calvin Alexander, a colleague at the University of Minnesota, plan to conduct a dye trace this fall to show where the water resurfaces. During low-water flow, "they will pour a fluorescent, biodegradable dye into the pothole and note where the dye reenters the river," the DNR said. So if the falls reconnects with the river, how come people don't see the stick they throw in at the top? That's a mystery, right? No. The DNR says fluid dynamics offers an explanation. "The plunge pool below the kettle is an unbelievably powerful system of recirculating currents, capable of disintegrating material and holding it under water until it resurfaces at some point downstream," Alexander said. That won't be the case for the dye they'll use to trace the water's path, he added. "Unlike larger objects, the dye molecules won't be held in Devil's Kettle." If the dye is found in the river below the falls, as the scientists suspect, Green acknowledged much of the mystery will be lost. "There's a little bit of that," he said, "that folks aren't going to stand there and wonder. But it will still be a fascinating spot, and a beautiful spot." "A few people may be disappointed," admitted park manager Peter Mott. "But eventually you learn to embrace that science, and make it part of your story."